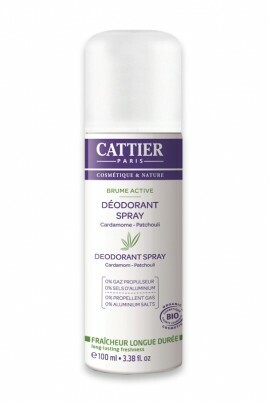 Cattier Organic Deodorant Spray "Brume Active" has been especially created for a gentle, fresh feeling of well-being all day long. Formulated without aluminium salts and no propellent gas, it protects and respects the skin and even the most sensitive. A natural active principal, which is both anti-bacteria and purifying prevents body odour without blocking the natural perspiration process. Aloe vera and organic witch hazel floral water calm and soften all skin types. It has an oaky perfume with undertones of patchouli and cardamom which envelops the skin in a discreetly perfumed veil. Thanks to its 100% ecological new system of diffusion without propellent gas, Cattier Organic Deodorant Spray "Brume Active" preserves the environment and the ozone layer. Sent bon et efficace ! Parfait !